We are excited to share this special time with all of our valued customers. Just a few reminders as 2018 is coming to a close. 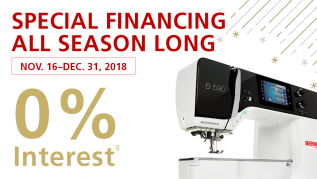 We are still offering 0% financing for 48 months on machine purchases of $3,000 or more for the remainder of 2018. 2019 is going to be an exciting year and we look forward to seeing you in the shop! If you are in need of fabric or thread during Christmas break feel free to give us a call to come pick some up, (463) 202-6750.